The Health Tech Alliance team got the chance to listen to Jeremy Hunt in conversation with Andrew Neil, where the Health Secretary gave an insight into his plans for the NHS and discussed in frank terms, the future of funding. The Daily Politics host questioned Hunt on whether the NHs was still ‘the envy of the world’, when outcomes lagged behind many other European countries, particularly in cancer survival rates. He admitted that outcomes must improve but stated that the NHS was the envy of the world, not necessarily for its outcomes but for its values, citing the fact that access to healthcare regardless of wealth, set us above others in Europe. When questioned by the Daily Politics host on the need to improve outcomes, Hunt referred to the recently promised £20bn of NHS funding, but warned that this money alone would not transform the NHS and that productivity must improve too and agreed with Neil that the amount promised would merely allow the NHS to “tread water unless it is spent differently from the past”. The Health Secretary said that NHS England were being given 6 months to draw up a 10-year plan to improve productivity, confirming that the money was indeed conditional on a suitable plan that met minimum requirements. 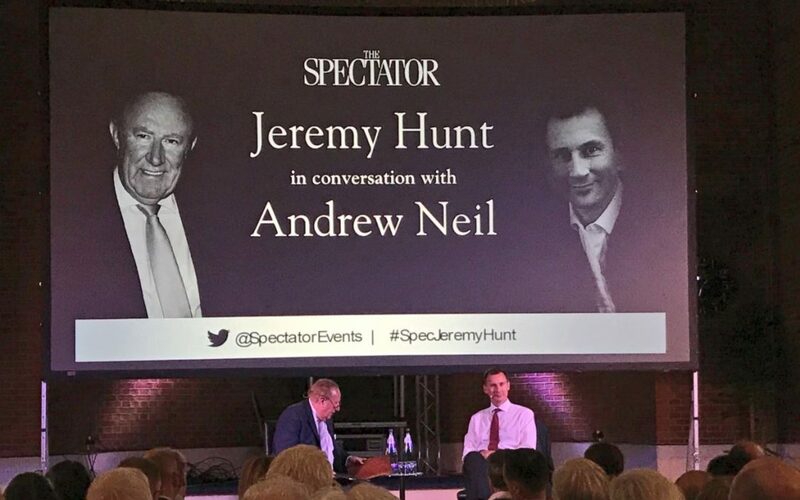 Neil grilled him further, asking if the Government was willing to deny the funding if the plan was not suitable, but Hunt assured his host and the audience that the expectations were discussed with NHS Chief Exec Simon Stevens, who believed it was do-able. The Government’s claims of a ‘Brexit dividend’ were not forgotten by Neil, who probed on whether the majority of the NHS bonus would be paid by such a dividend, to which the Health Secretary admitted that it would not, at least not for 2020 or 2021 when we still had clear payments to make to the EU. He admitted that taxes would go up to fund the spending boost and stated that the Prime Minister had been upfront about this, arguing that if voters are given the choice of lower taxes or better public services, people will choose the latter. Asking his final question, Neil questioned on whether health would indeed be his last job in British Politics. To this, Hunt’s answer was coy, but he stated that if it was his last job, he would be immensely proud.